Only 6 out of 10 schools in the India have access to electricity. Only 65% have usable toilets. 53 % of students dropout before completing primary school. 40 out of 100 girls that enroll in rural school reaches grade four. Top five nation to have primary level children out of school. Internet penetration is just 19%. Rise of almost 65% cyber related crime since 2014. Children are the most vulenrabel category to digital learning. Lack of proper infrastructure, poor curriculum and larger emphasis on theoritical learning, limits opportunities for children to learn. 92% teachers feel absence of life skill training within curriculum. GlobalHunt Foundation is supporting schools in improvising their existing infrastructure through making available sanitation facilities, sports equipments, teachers training , STEM and computer labs etc. By improving school infrastructure the purpose is to increase student participation, reduce the drop out rate and improve the quality of education which is lacking among schools catering to children of underprivileged and rural communities. GlobalHunt Foundation in order to make weaker students come at par with their peer groups is undertaking after school remedial classes. Where children who are falling below their class wise learning levels are enrolled and through interactive based education are taught. The classes help students to comprehend concepts that are not well covered in schools. GlobalHunt Foundation is implementing life skills classes in schools that are catering to specially-abled, underprivileged, rural and semi-rural school going children. Through the learning children are being given the opportunity to develop and promote creative insights and cognitive skills. By introducing these classes the children are learning to understand various concepts other than the ones imparted to them theoritically. GlobalHunt Foundation is working at the school level to introduce computer learning classes for children that are devoid of such learning. The Foundation is also is building cyber resilience among them by undertaking knowledge dissemination sessions. 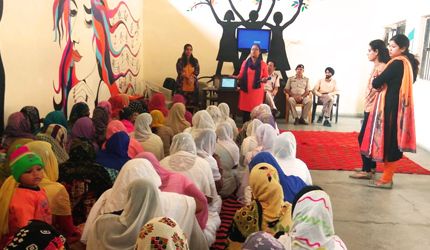 By engaging in interactive communication school children are sensitized towards cyber crime issues such as online harassment, abuse and exploitation. We are working in some of the most rural communitites and wants to further cover more such geographies where education is still an issuue. We are educating the lesser privialged community children that require support to integrate themselves within the rising India. We are building support systems so as to enhance the academic and cognitive skills among children.